Ekbatan, a city in the City. Shahrak Ekbatan is a housing estate in Tehran, facing the historical Mehrabad Airport. The estate was built in the 1970s by american architects, just before the iranian revolution. It comprises about 20 000 apartments in its tower blocks. Shahrak means « small city » in persian. When coming from Tehran and entering Shahrak Ekbatan, you feel like you enter another city inside the capital city. Several dozens of blocks are built around central spaces left for shops and recreational spaces like parks and greens. Each block is made of high-rises between 6 and 13 floors, with more than 500 apartments in each tower. Shahrak Ekbatan was from the very beginning designed as a luxury estate, and stays up to this day a model of comfort attracting the well-off in Tehran. 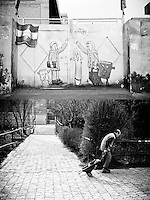 With this series of 7 diptychs, I decided to explore the perplexing paradoxical nature of life in Iran. As if picturing that city inside the city was also a way to picture the lives of iranians, split up between their public and private lives, between the imperatives of the society and their inner self. 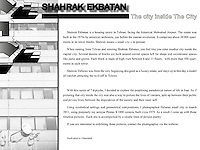 Using symbolical settings and geometrical compositions, I photographed Ekbatan small city in march 2011, using purposely my antique Pentax K1000 camera, built circa 1979. As a result I came up with those timeless pictures. If you are interested in exhibiting those pictures, contact the photographer via the website.